NASA's Aqua satellite passed over Typhoon Jebi in the Northwestern Pacific Ocean and saw a well-organized typhoon with a small eye. 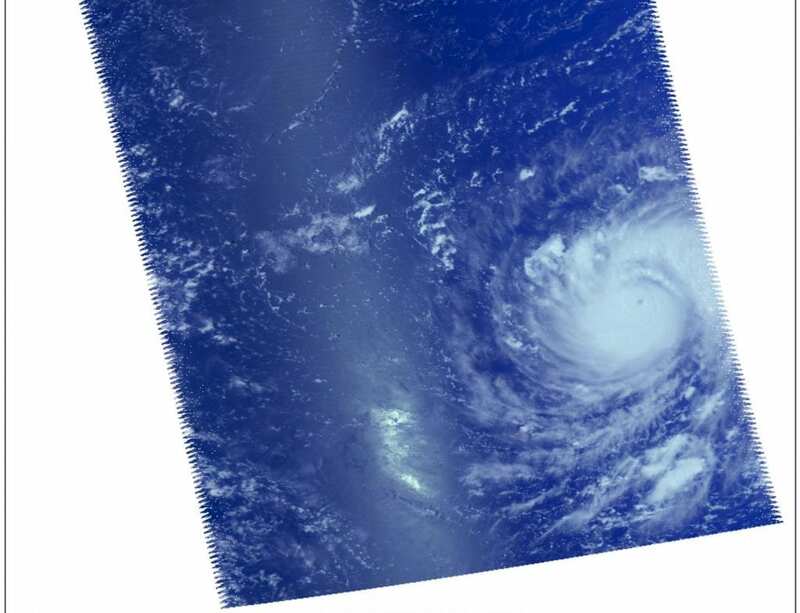 NASA's Aqua satellite passed over Jebi on Aug. 29 at 11:53 p.m. EDT (Aug. 30 at 0353 UTC), the Atmospheric Infrared Sounder or AIRS instrument analyzed the storm in infrared and near visible light. Enhanced infrared satellite image showed deepening convection and colder cloud tops encircling the eye. Forecasters at the Joint Typhoon Warning Center noted "While the structure continues to improve, winds will lag slightly as the primary circulation catches up to the secondary circulation represented by convection. The environment remains favorable for continued intensification with warm sea surface temperatures, low vertical wind shear, and radial outflow." On Aug. 30 at 11 a.m. EDT (1500 UTC), the eye of Typhoon Jebi was located near latitude 17.8 degrees north and longitude 146.2 degrees west. That's about 161 nautical miles north-northeast of Saipan. Jebi was moving toward the west near 14 mph (12 knots/22kph). Maximum sustained winds have increased to near 126.6 mph (110 knots/203.7 kph) with higher gusts. Norman is a category 4 hurricane on the Saffir-Simpson Hurricane Wind Scale. Some additional strengthening is forecast during the next 12 to 24 hours. Jebi is expected to strengthen and maintain that strength for one and one half days, before finally starting a weakening trend on Sept. 1. Jebi is forecast to pass to the south and west of Iwo To island on the way to the big island of Japan.